In Chasing Rainbows Video Slot, you will be chasing rainbows – realistically sounding, right? the realistic part of it all is this vibrant Video Slot brought to you by the British Realistic Games. The rainbow is a common phenomenon appearing all over the world. Surely you heard, after the rain comes sunshine – well, with it comes a rainbow. Colour-wise, the rainbow consist of an overleaps from red, to yellow, green, and blue, going to violet shades. As soon as rainbows cover the skies and the sun is low, you will see it. For all times, myths, fairy-tales, and folklores have circulated telling us various tales about this beauty. In Irish folklores, the leprechauns hid away its gold treasures at the end of the rainbow. The Chinese mythology says that the rainbow is a scratch in the sky, sealed by the Goddess Nuwa with the help of seven stones of seven different colours. In the Nordic mythology, the rainbow is called “Bifrost”, which is said to be a bridge that Heimdall guarded and united with Asgard with Midgard. What kinds of mythologies and dreamy treasures Chasing Rainbows hides away, will be revealed now! The rainbow-coloured numbers and symbols that you will see on the reels belong to the base game, and they are also the lower valued symbols. Somewhat higher wins are given by the brown animals eye, the ginger prince, the blue king, the green fairy, and the white unicorn with a pink mane. The shield made out of gold and metal, with a golden logo on it – is the most valuable symbols of the game. If you land five of them, you can win up to 5000 coins. There are two Scatter Symbols in this game, both represented by shields. One of the shields with the initials of CR (which stands for Chasing Rainbows) and this can appear on reels 1 and 5. If you land this symbol, you will trigger the Free Spins Feature that awards you 10 Free Spins and has a potential to flood the reels with Wilds. Wilds can appear anywhere on the reels during the Bonus Game and when it appears it can lock a reel in place while the rest keeps on spinning. The maximum payout during the Free Spins Feature is 5000x the worth on your payline. As if that wasn’t enough, the Free Spins can also be re-triggered. Chasing Rainbows Video Slot offers 5 reels over 3 reels, with additional 20 paylines. 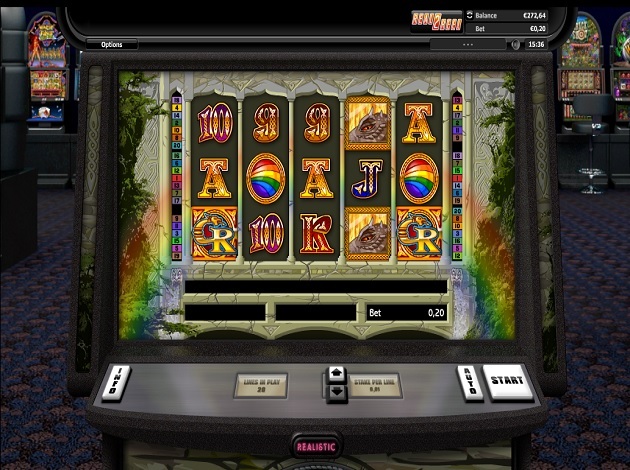 the winning combinations are completed from left to right on the rows and they are all kept active in the gameplay – meaning that the paylines are fixed. Underneath the game field, you can adjust your bet per line, see the total bet, how much you won, and make settings for Autoplay. The game holds an RTP of 95.47%. The game field is placed against a stone castle, in front of this are wild trees growing – all beautifully cut and formed. All symbols are placed against a brick wall and below it, you can see two dragons´ heads made of stone, injected into the wall with water flushing out of their mouths. You can also see the rainbow both to the left and to the right side of the reels. The icons in Chasing Rainbows Video Slot is a mid-age dividing of power where the ruling king or queen had the responsibility of the defence of the land, where supreme judges and tax drivers were only a memory. The only thing you need to focus on today, is the grand graphics, the stunning designs, and to find your way to the end of the rainbow – and collect the hidden treasures. Will you be the first to find it? Let´s find out! Many years’ experience in the gaming industry is always an advantage to hold when starting a business – and this is just one of the reasons behind this game developers grand knowledge in what to grant players and operators. A key to success is being able to keep a good and strong partnership, as well as being able to offer something that not all have. Back in 2002, a group of passionate entrepreneurs came together to found Realistic Games. The company was started with a goal and vision to be able to offer high-quality content for some of the biggest and world leading gaming operators. They do this with a team of all specialities and professions needed to reach their goals. Their technologists, designers, artists, and modellers work alongside the commercial and marketing teams to get to where they need to be. The games from Realistic Games and the entire portfolio is a wide blend of types of games. The company isn’t focusing on solely one thing, but multiple to allow more entertainment opportunities. Realistic specialises in tailoring Roulette, Blackjack, Slots, and fixed odds bets to a wide range of devices. These all include PC´s, iPads, iPhones, Androids, and tablets – but also, cool enough, in gambling machines on the high street. Do not miss the opportunity to play a nerve-tickling Battle in our unique and special platform, the first of its kind: Battle of Slots. Videoslots.com grants you a social online gaming experience where you can play against friends and other players at Videoslots.com in games from NetEnt, Thunderkick, and Play´n GO. There is only one Battle of Slots – and you will only find it here!